Morrisville, NC – Wasatch Photonics announces the launch of its WP OCT software platform as an enabling tool for research and OEM development, with the power and flexibility to speed OCT system development. 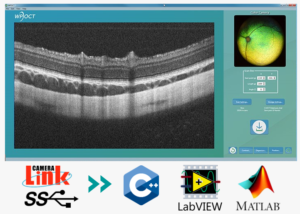 This suite of SDKs, sample GUIs, and turnkey application software facilitates imaging speeds of up to 250 kHz with minimal software development effort, while retaining the flexibility to customize user interface, algorithms, and analysis. Availability in C++, C#, Matlab, and Labview environments further enhances the versatility of this platform, as does compatibility with both Camera Link and USB 3.0 data acquisition protocols. OCT is one of the fastest growing imaging technologies, with wide ranging applications in both the medical and industrial space as a primary and complementary diagnostic. The technology has been widely adapted in ophthalmology as the standard of care. It is anticipated that several next-generation surgical, diagnostic, metrological, and material processing systems will benefit from the high-speed and high-resolution capabilities of OCT imaging. 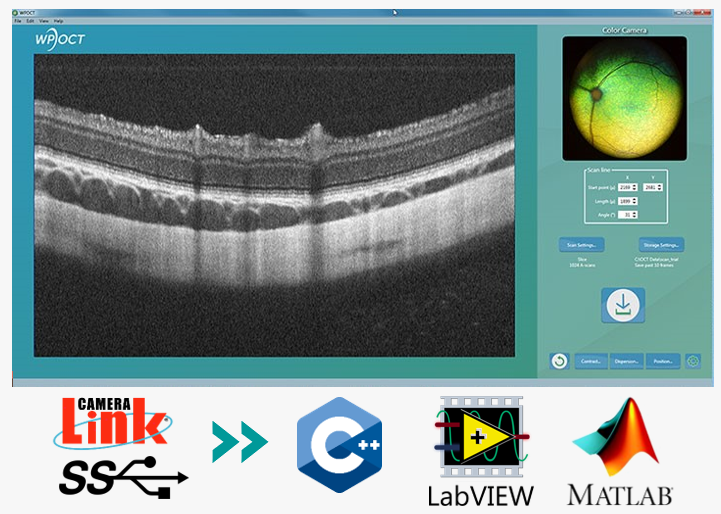 As a leading OEM provider for optical coherence tomography (OCT), Wasatch Photonics actively invests in technologies and capabilities to expedite the development process for OEMs launching integrated OCT products. This wide variety of fields use an array of different software and hardware platforms for prototyping and production. As such, the WP OCT software platform allows flexibility both in choice of software environment as well as in the hard accessories that OCT developers can use. SDKs are available for seamless integration of applications developed in C++, C#, Matlab and LabView environments, and allow the developer to transition from prototype to production using the same base set of libraries. On the data acquisition side, the software platform will allow communication with both Camera Link and USB 3.0 data acquisition protocols. It will provide high end computational capability for efficient data analysis using powerful yet flexible GPU platforms, compatible with the fastest OCT spectrometers available on the market. Wasatch Photonics offers a comprehensive line of modular and turnkey OCT imaging products for researchers and OEMs. See the new WP OCT software suite live during the 2019 Photonics West Conference in San Francisco CA. For immediate information, contact the Wasatch Photonics OCT Product Division: info@wasatchphotonics.com or by phone: +1 919-544-7785. Founded in 2002, Wasatch Photonics designs, manufactures and markets high-performance optical coherence tomography (OCT) products, spectrometers and systems for Raman, fluorescence, and UV/VIS/NIR spectroscopy, and volume phase holographic (VPH) gratings for pulse compression, astronomy, spectral imaging, and OCT. Their high-performance VPH gratings, spectrometers, and systems are used in a diverse set of industries, including those in the defense and security, chemical manufacturing, pharmaceutical, medical, energy, education, computer, and electronics markets. Wasatch Photonics’ optical coherence tomography (OCT) solutions range from spectrometers and probes for research and OEM use to full plug and play systems for ophthalmology, dermatology, angiography, and nondestructive testing.